Cyclists are likely all too familiar with dangerous or inattentive drivers, especially in larger cities like Philadelphia. Did you know that, in 2016, roughly half of all injuries and fatalities in Philly were related to pedestrian accidents? As a result, the city recorded a higher average of pedestrian-related accidents than the rest of the nation that year. According to the Bicycle Coalition of Philadelphia, “Those 2016 pedestrian deaths represented the highest number of people killed while walking since 1990.” The next year’s numbers were on par with those reported in 2016, with around 45 percent being related to pedestrians (including bicyclists) getting hit by motor vehicles. Everyone has the right to enjoy life freely and safely. If you have suffered an injury because of another driver’s negligence while riding your bike, then you are likely entitled to receive compensation for damages. Philadelphia bicycle accident attorney, Adam Grutzmacher, has dedicated his career to helping wrongfully injured victims receive justice. He has always been passionate about helping those in need and has consistently made an effort throughout his career to do all he can to do so. He is licensed to litigate cases in both Pennsylvania and New Jersey and is an active member of the Pennsylvania Association for Justice — an organization dedicated to helping local Pennsylvanians find resources as well as advocating on their behalf. What Are Common Types of Bicycle Accidents? Like most accidents, bicycle accidents can occur in a number of different ways. They can usually be attributed to motorist error related to distracted, aggressive and/or inattentive driving. Right Cross. This type of accident occurs when a car pulls out from an alleyway or street from the right, either hitting a cyclist or causing the cyclist to hit the vehicle. Right crosses are one of, if not the, most commonly reported cause of bicycle accidents. “Door Prize”. When a door prize accident occurs, a driver has opened the door of a car that is parallel parked, either hitting a cyclist or causing them to swerve into another lane causing an accident. Left Cross. If a driver going the opposite direction as a cyclist turns left suddenly and causes the cyclist to hit his or her car — or otherwise get into an accident as a result — that is called a “left cross” accident and the driver is likely to be held liable. To help prevent these accidents from happening, you can attach a headlight to the front of your handlebars and wear bright clothing (even in the daytime) in order to stand out on the road. However, motorists are ultimately responsible for checking for cyclists and pedestrians before turning across traffic. There are of course other types of bicycling accidents. If your injury was caused by another driver’s negligence, then you should seek out a seasoned Philadelphia bicycle accident attorney as soon as possible to start building your case. What Rules Must Cyclists Follow Under Philadelphia’s Bicycle Laws? Cyclists must follow the same general rules as other motor vehicle drivers — as bikes are technically considered vehicles — such as yielding at traffic signals for pedestrians and not driving under the influence. However, there are some obvious key differences. Due to these differences, there are some laws that bicyclists must follow exclusively in order to protect themselves to a maximum extent. Maintain Bike Equipment. It is a bike owner’s responsibility to ensure that all parts of the bicycle — brakes, reflectors etc. — are in prime operating condition. The Commonwealth of Pennsylvania enforces that all brakes must allow a bicycle traveling at 15 miles per hour to reach a complete stop within 15 feet of applying the brakes. Further, the bike’s rear reflectors must reflect light emitting 150-300 feet from the rear and have “amber reflectors” on each side of the bicycle. Not only will you be following the law by performing such routine maintenance on your bike, but ultimately preventing a potential bike accident involving faulty machinery. Follow All Traffic Signs and Lights. Cyclists are still required to adhere to all traffic indicators (signs, lights etc.) just like anyone else. They are also required to appropriately signal with their arm before turning and yield to pedestrians crossing the road. Be aware that it is also considered your responsibility as a cyclist to know and appropriately perform all the proper hand signals. Failure to do so could come back to haunt you in a personal injury lawsuit if it resulted in the accident and/or injury. No Distracted Driving. Distracted driving is one of the top causes of motor vehicle accidents across the board. For this reason, more and more states are implementing the “hands-free driving” rule — and Pennsylvania is one of them. This goes for all drivers, including cyclists. Unfortunately, many drivers do not adhere to this law and, as a result, accidents are occurring at an increasingly alarming rate. Other rules of the road may also apply. If you were injured in a bicycling accident due to another driver’s negligence on the road, you may be entitled to compensation for damages incurred. An experienced Philadelphia bicycle accident attorney can help you determine if you have a case or not and, if you do, help you build a strong claim. Regardless of the reason why you ride a bike, you are entitled to do so in a safe manner. If your safety is jeopardized by a negligent driver and you are subsequently injured as a result, then know that you have legal rights and options that you can pursue. 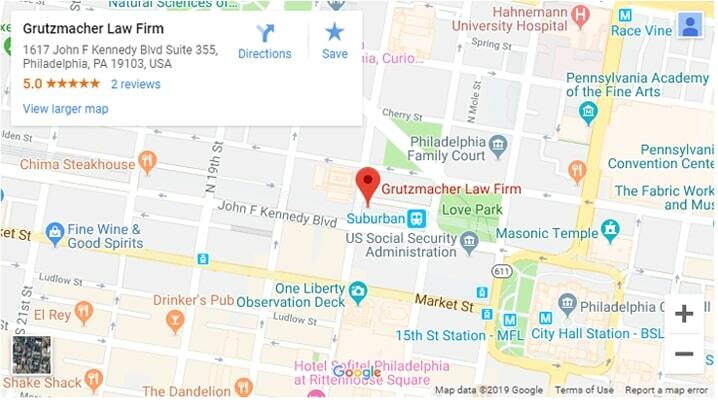 Local Philadelphia bicycle accident attorney, Adam Grutzmacher, has successfully litigated cases for wrongfully injured clients across Pennsylvania, as well as New Jersey, for over 10 years. He knows what it takes to win favorable outcomes for his clients and works tirelessly to ensure that each client’s rights are protected and their needs are met in every case. If you have questions about a personal injury claim regarding a bicycle accident, our law firm offers complimentary consultations. During this initial meeting, you can meet attorney Adam Grutzmacher in person and tell him all the details of your case. In turn, he will give you legal advice as to how to proceed. It is his goal that every person, whether a client or not, walks out the doors with more peace of mind than when they walked in. Contact us today to schedule your free consultation.